7/16/14 Send In the Clowns with Meria and Dave McGowan. The Lincoln series continues. 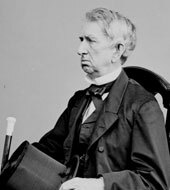 The preposterous attack at the home of William Seward, Lincoln’s Secretary of State. Did it actually happen? Seward was hated by the Republicans at the time, forced his resignation; Was his carriage accident used for the story? Who was Lewis Powell? Was he Superman? 20 yr old kid takes on 9 men (some armed) and gets them all? Open conspiracy to kill Lincoln, yet they say conspiracies are for nutters; simultaneous hits planned on 5 members of Lincoln’s cabinet; Witnesses died shortly afterward (typical M.O. used up to today); Was there another assailant? Seward bedridden, yet Powell misses with a knife? A stab to the jaw? contradictory testimony at the “trial”; Emerick Hansell, were there two of them? (shades of Lee Harvey); 30 rooms and Powell beelines for Seward’s bedroom? ; body doubles? same initials? Powell hung and Robinson was rewarded – even got the knife. No annoying commercials. No govt or corporate funding. Just truth and your subscription. Subscribe for total access to site 24/7.